Mayfield will have a new No. 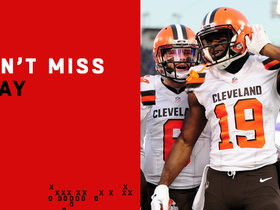 1 receiver in 2019 after the Browns traded for Odell Beckham on Tuesday. Mayfield is pleased with the Browns' decision to promote Freddie Kitchens to head coach, Pat McManamon of ESPN.com reports. 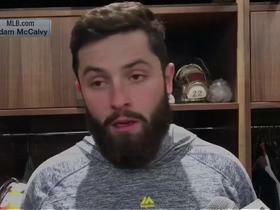 "I kind of had that sense the whole time," Mayfield said Wednesday. "Seeing how [Kitchens] was, how he didn't change when he made the jump from running backs coach to offensive coordinator. 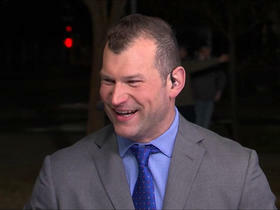 Then just taking over and the difference that we had while he was calling plays." Mayfield completed 23 of his 42 pass attempts for 376 yards, three touchdowns and three interceptions in Sunday's 26-24 loss to the Ravens. Mayfield completed 27 of 37 pass attempts, racking up 284 yards and three touchdowns during Sunday's 26-18 win against the Bengals. The rookie quarterback added six rushes for 16 yards. Mayfield completed 18 of 31 passes for 188 yards with two touchdowns and an interception in Saturday's 17-16 win over the Broncos. He also lost a fumble. Mayfield completed 18 of 22 passes for 238 yards and a touchdown while adding two yards on four carries in Sunday's 26-20 win over the Panthers. 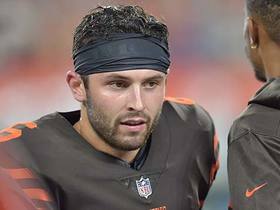 Mayfield completed 29 of 43 passes for 397 yards, one touchdown and three interceptions in Sunday's 29-13 loss to the Texans. 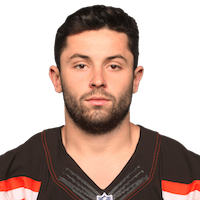 Analysis: In the first half, Mayfield completed just five of 13 passes for 46 yards and three interceptions, as his team took a 23-0 deficit to the locker room. The rookie first overall pick played much better with his trailing team employing a pass-heavy approach in the second half, and he finally found Rashard Higgins for a 17-yard score with 2:58 remaining. Mayfield will try to be sharper from the get-go against the Panthers in Week 14. Mayfield completed 19 of 26 passes for 258 yards and four touchdowns in Sunday's 35-20 win over the Bengals. 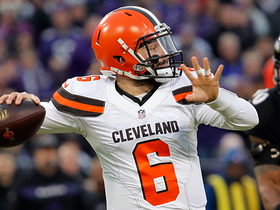 Mayfield completed 17 of 20 passes for 216 yards and three touchdowns while rushing six times for 20 yards in Sunday's 28-16 win over the Falcons. Analysis: Mayfield connected on all 12 of his first-half passing attempts. Those included a terrific throw despite getting flushed out of the pocket for a 28-yard touchdown to Rashard Higgins and a 13-yard score to Nick Chubb. Mayfield added an 11-yard touchdown pass to Duke Johnson in the third quarter and turned in a mistake-free effort to pull out the 12-point win. He'll be on bye in Week 11. Mayfield completed 29 of 42 passes for 297 yards with two touchdowns and an interception during Sunday's 37-21 loss to the Chiefs. 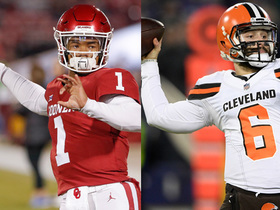 The "Good Morning Football" crew explains how Cleveland Browns head coach Freddie Kitchens will do with quarterback Baker Mayfield. 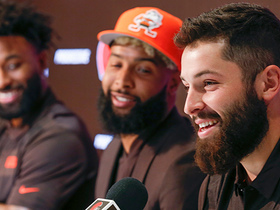 Would Joe Thomas like to play for the Browns now that Baker Mayfield is under center? Thomas weighs in on Cleveland's rookie quarterback. 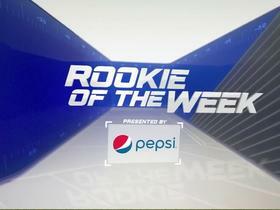 Cleveland Browns quarterback Baker Mayfield wins Pepsi Rookie of the Week for Week 17 of the 2018 NFL season. 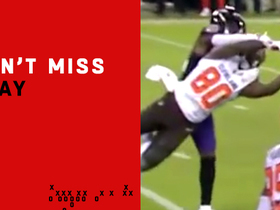 "NFL Total Access" review Cleveland Browns quarterback Baker Mayfield's play-action fake play against the Baltimore Ravens during Week 17. 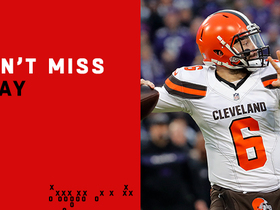 Cleveland Browns quarterback Baker Mayfield tosses a 40-yard pass completion to Rashard Higgins in Week 17 of the 2018 season against the Baltimore Ravens.